Mariel Moves | Creating a healthy life…one move at a time! Creating a healthy life…one move at a time! Let’s talk about yogurt for a second, shall we? In addition to many different types of yogurt there are, of course, a million different brands to choose from. Not to mention nutrition labels to read! To me, it’s all very overwhelming. I just want a yogurt that tastes great, doesn’t have a bunch of sugar or other unwanted ingredients and doesn’t cost me an arm and a leg! Is that too much to ask? I was very excited to try this yogurt and when I did I was even more excited! 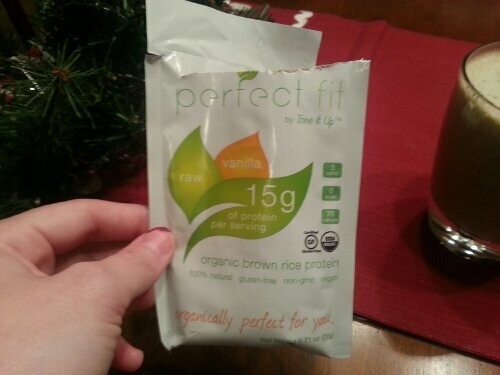 Each individual cup (5.3 oz) packs tons of flavor, at least 10g of protein and only 100 calories! And bonus, it comes in 8 different flavors! (I’ve only tried the Vanilla thus far, but trust me, I’ll be back for more). I don’t know about you but typically when I have Greek yogurt I have to mix it with granola, or honey or a little something. Not sure why, but there has always been something about the taste of Greek yogurt plain (even if its flavored) that didn’t mesh with my crazy taste buds. 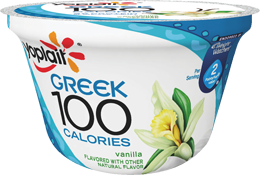 However, I am happy to report that with Yoplait Greek 100 Vanilla, this is not the case. Finally! A Greek yogurt that I can throw in the lunch box, tear open and just EAT! If you can’t tell by this point (which I’m SURE you can – you’re all smart individuals), this may be my favorite Greek yogurt E.V.E.R. and if you haven’t picked up on it yet, I’ll just come out and say it…you should head to the store and try this, NOW! So, tell me, do you have a yogurt that you just LOVE? Anyone else get embarrassingly excited when you find new food products that you love, simply by accident? 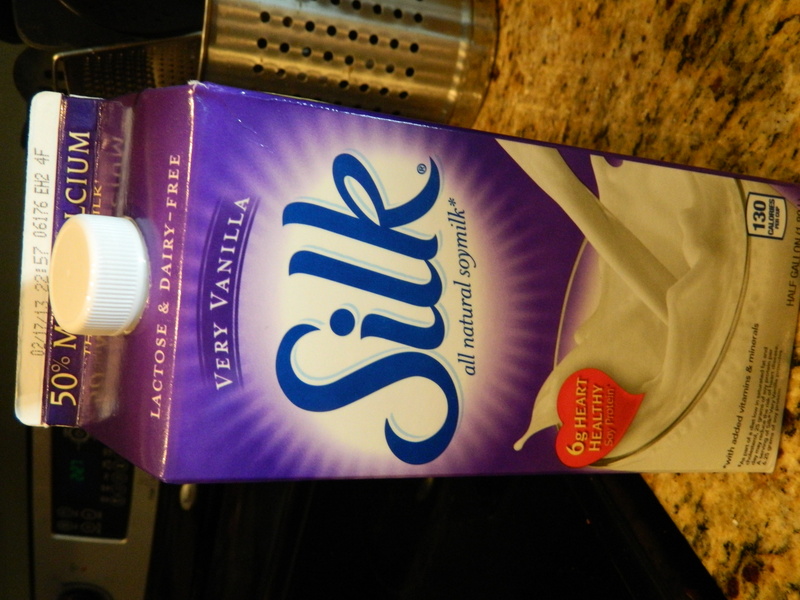 This entry was posted in Food, Product Reviews and tagged Best Greek Yogurt, Yoplait, Yoplait Greek 100 on January 8, 2013 by marielmoves. In keeping with this year’s theme of ‘simply living,’ I wanted to share this little story I happened across. Sometimes in the midst of it all, a simple reminder like this can make all the difference. Hope you enjoy! This entry was posted in Simply living and tagged Clarity, life lessons, simply living on January 7, 2013 by marielmoves. This weekend has just flown by for me! Anyone else? While I won’t bore you with every single thing that we did this week (or still plan to do! ), here’s a quick rundown of this weekend’s festivities. Friday night, as I blogged about here, we had a pretty low key night. We are addicted to Breaking Bad. Can.not.get.enough. We had to run out to Target this morning and buy Season 3 because we couldn’t wait to start watching it. If you haven’t seen it, I highly suggest you do! Saturday was a bit more productive. We started our morning by taking Peanut for a quick walk and then headed to a local breakfast place called The Farm at South Mountain. Their Morning Glory Cafe is delicious and has a dog friendly patio, so we took Peanut along. If you live in the Phoenix area and have never tried The Farm for breakfast or lunch, definitely do! After watching a few more episodes of Breaking Bad, I headed out for my 8 mile run. And run I did. This was a new PDR for me, so going in I was excited and nervous at the same time. To keep it interesting, I drove about ten minutes down the street to a local park for my run. When I first started I created a loop that was a little over 2 miles and so I just repeated that about 4 times…this strategy worked for me. It spiced things up but also let me know exactly how much actual ground I had left to cover. Even though I was wearing my watch, this physical distance reference kept my head in the game. And, I finished! And honestly, I felt pretty strong. I won’t say I was speedy…because trust me, I wasn’t I covered 8 miles in about 1:27. But I’ll take it! My race isn’t until March 2, so I still have plenty of time for training! 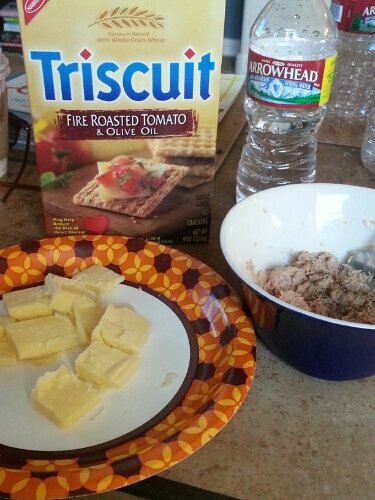 Came home and was starving so I made a quick snack of cheese, tuna fish and crackers. And a few sour patch kids snuck their way into my mouth too. After snacking, more Breaking Bad, and a quick shower, we headed out to Four Peaks Brewery with a couple of friends for dinner. The place was packed! But we ended up waiting and had a good time chowing down on some delicious food and chatting. This morning Justin and I hit the gym for a quick workout. I ran 3 miles in about 28 minutes and let me tell you, they were a tough three miles. I think my legs just wanted to rest. After our workout, it was smoothie time! 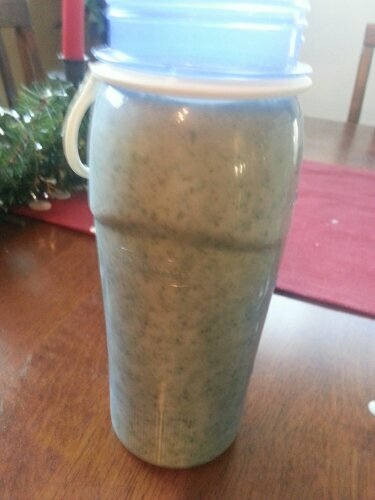 and spoiler alert, my green smoothie for today, didn’t turn out so green. But it tasted delicious, so I’ll take it! I’ve got to get started on taking down these darn Christmas decorations…my motivation? More Breaking Bad! 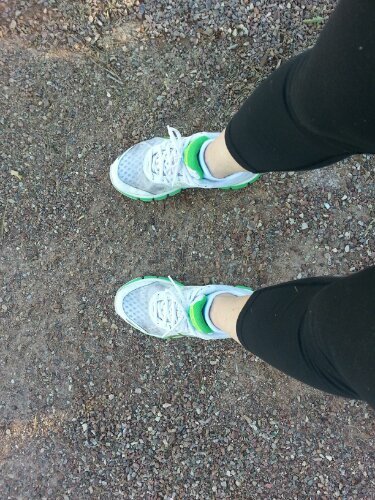 This entry was posted in Recipes, Running, Smoothies, Weekend Wrapup and tagged Breaking Bad, Four Peaks Brewery, Green Smoothie, Half Marathon Training, Sundays, The Farm at South Mountain on January 6, 2013 by marielmoves. Welcome to Friday night in the Kelley household. 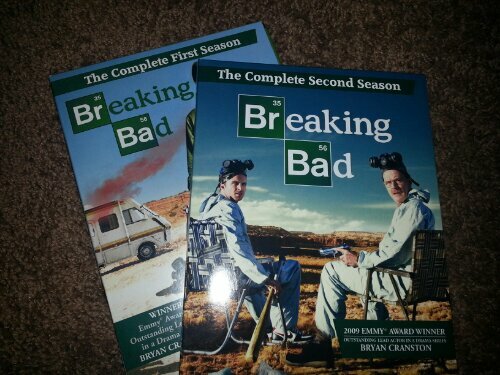 We’re on the third disc (of four) in season 2 of Breaking Bad….and counting. We just started on New Years Day from the very beginning. Talk about addiction. And Peanut is nice and comfy snuggled up next to us. Hope your Friday is as relaxing as ours! 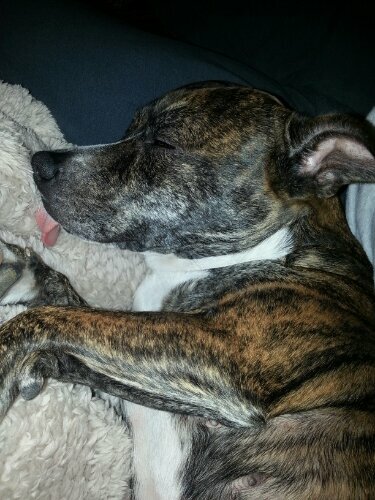 This entry was posted in Doggies and tagged Breaking Bad on January 4, 2013 by marielmoves. Good Morning Afternoon, whatever, and Happy Friday! 🙂 Though this work week was only a short one, it sure felt like a normal week to me! 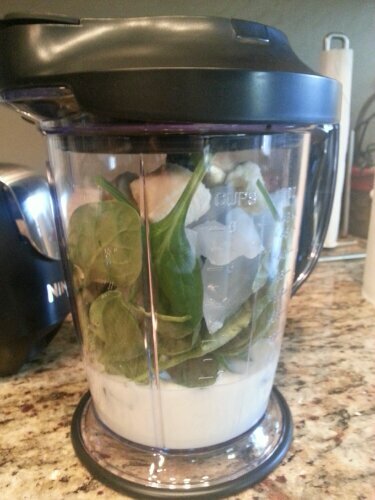 Since I’m participating in Real Food Runner’s Green Smoothie Challenge I started my day off right with a Green Smoothie. 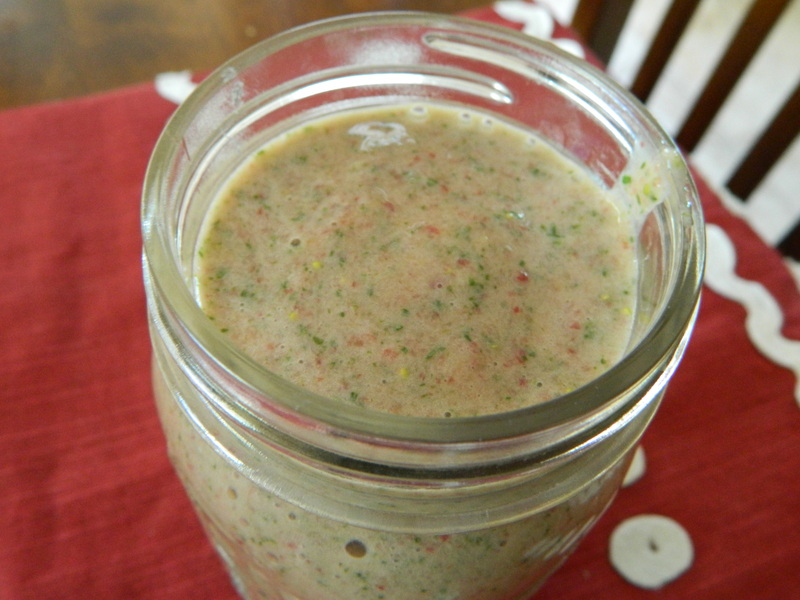 This variation is a pretty traditional one as far as Green Smoothies go and is sometimes referred to as the Green Monster. 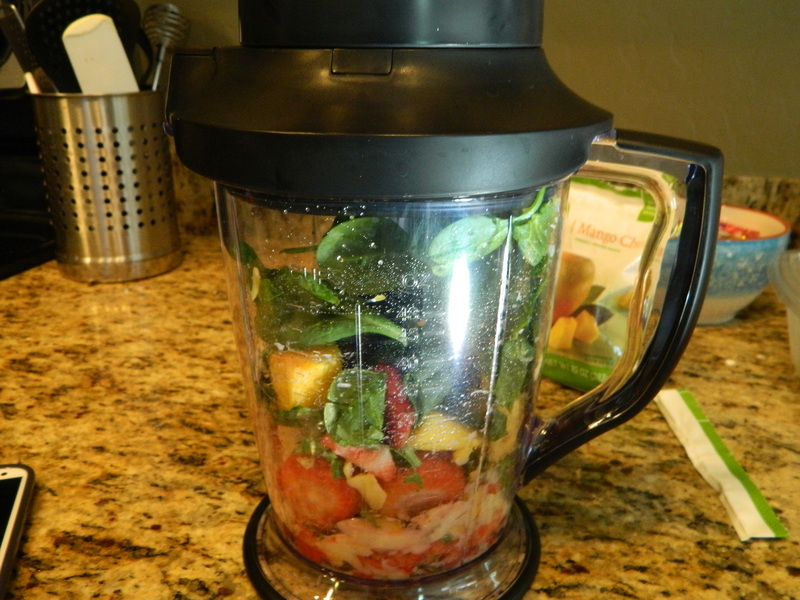 So far, I’ve really enjoyed making a green smoothie a part of my day. They seriously pack so many vitamins and nutrients in one shot that I really should drink them more often than I normally do. AND they’re actually delicious! I have a few new recipes that I’m excited to try out this weekend, so I’ll definitely post those for you and give you my thoughts once I’ve had a chance to make them! Anyone else still have their Christmas tree and decorations up? Nope? Just me? Kinda thought so. 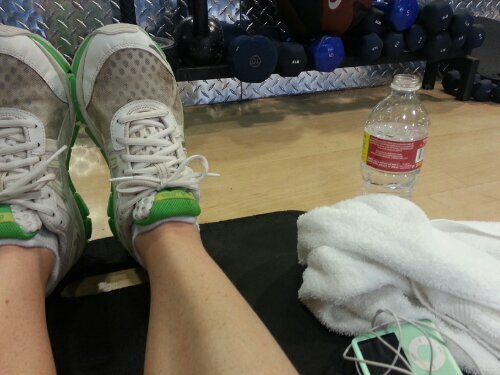 Given that this week was a whacky one…my training for this week was all off. Not only were we in San Diego last weekend but then NYE came and it really just distracted me. I did end up running 7 miles on New Years Eve…so there’s that. But for the most part, I didn’t do much other training this week. I am planning to go for a 3 or 4 mile run tonight and get back on the horse with a long run this weekend and my normal training plan starting next week. Speaking of workouts, I’m planning to start tracking my weekly workouts here on the blog to not only help myself plan, but to hold myself accountable to what I’ve planned. It’s never any fun to publicize the fact that you decided to sit on the couch instead of hit the pavement…so I’m hoping this helps keep me motivated on those days where the couch is calling my name. 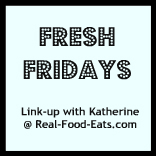 In addition to the Green Smoothie Challenge I’m participating in, Real Food Runner also does a thing called Fresh Friday (every Friday, as you would guess) where you detail “3 things that made your week fresh and fantastic!” Here goes for my first stab at Fresh Friday! 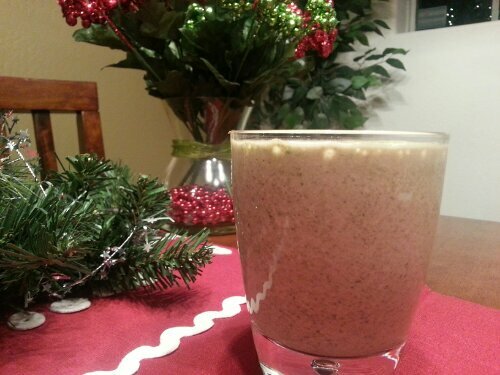 #2: The Green Smoothie Challenge. This has truly reminded me that incorporating healthy snacks into your everyday really can be super easy! 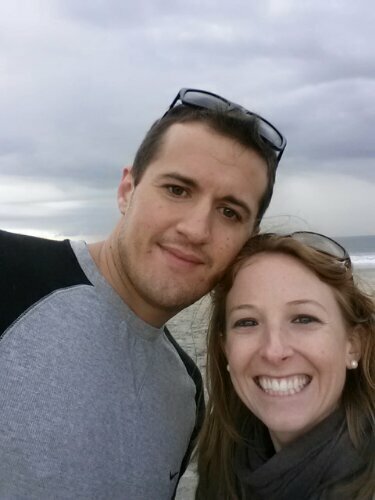 #3: Weekend trip to San Diego. Sometimes all it takes is getting out of town for a bit to rejuvenate and revitalize yourself. Having an awesome husband and pretty cute dog to spend that time with doesn’t hurt, either. P.S. Did you notice that Mariel Moves got a mini-facelift last night? It’s a new year so I needed a new design on the blog. I plan to continue to enhance this as I continue to establish my blogging adventure. A big shout out to Kim at 733 Design. She did an amazing job and was so super great to work with! 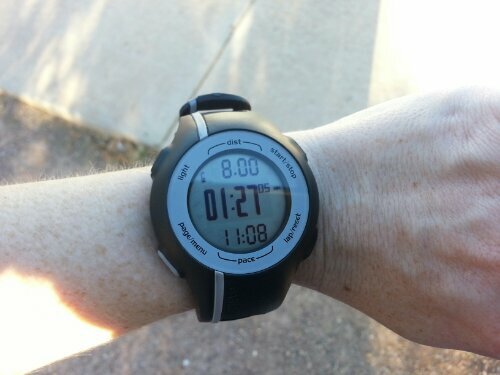 This entry was posted in Racing, Recipes, Smoothies and tagged 733 Custom Blog Design, Fresh Fridays, Green Smoothie, Phoenix Half Marathon, Real Food Runner, Smoothie on January 4, 2013 by marielmoves. Okay, now that my San Diego Weekend Recap post is out of the way, let’s get down to my eats for the day! Breakfast today was a quick bowl of Quaker Oatmeal Squares as I rushed around the house getting ready. Thus why there is no picture… But I think you can imagine my simple bowl of cereal, right? Right. Lunch was also quick and simple. I headed to a local stir-fry joint and constructed my own concoction of chicken, carrots, zucchini and green beans with brown rice and teryaki sauce. 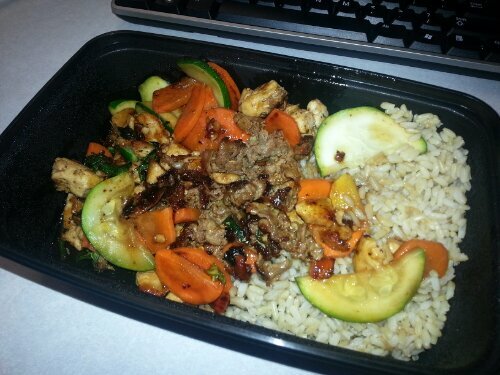 I seriously inhaled this lunch, I was SO hungry. Tonight was a night of leftovers for Justin and I. I didn’t necessarily have anything planned for dinner so we worked with what we had. Easy brats thrown on the grill with leftover pasta salad and veggies and dip from our new years eve party. Easy peasy and still delicious! 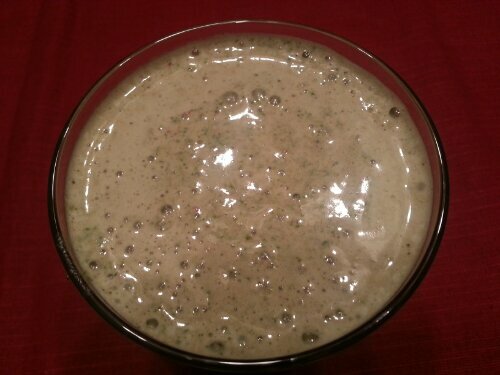 So I believe that the protein powder sort of altered the color of my smoothie a bit…it turned out a bit more brown than the normal bright green. As far as taste goes, it tasted normal so, oh well! Though I will say it’s difficult to drink a smoothie when it’s chilly outside! All the more reason to crank up the heat and cuddle up under a blanket, right? And that’s JUST what I’m about to do! Justin and I made it all the way to Season 2 of Breaking Bad yesterday and I can hear that and my couch calling my name! Have great night everyone! 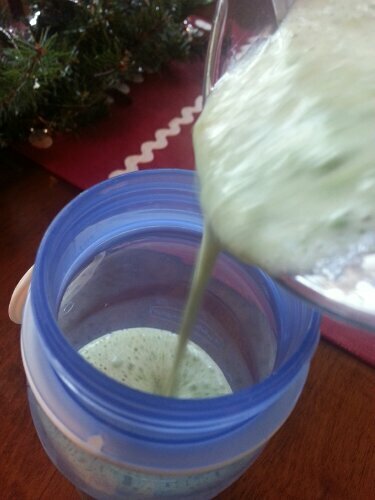 This entry was posted in Meals, Smoothies and tagged Green Smoothie Challenge, Perfect Fit Protein Powder, Tone It Up on January 2, 2013 by marielmoves. Happy Monday Wednesday everyone! It sure feels like a Monday to me and I’m having a hard time getting back into the swing of the professional world after such a long holiday break. Justin and I were a little nervous about a 4.5-5 hour car ride with our dog considering the longest she’d ever be in the car previous to this was about 20 minutes. However, we were worried for no reason. Peanut climbed right onto daddy’s lap and proceeded to sleep for the majority of the drive. Win! However, this meant that I did ALL the driving…not so awesome. Oh well, though…we made it safe and sound! 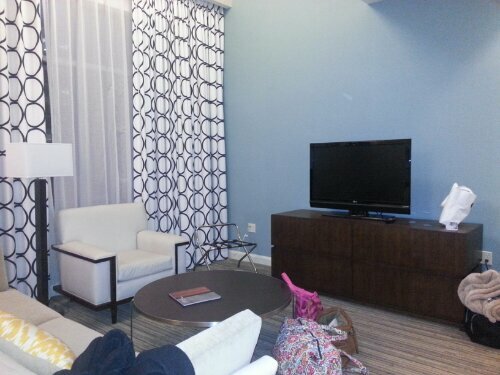 Justin and I were staying at the Hilton Gaslamp Quarter Hotel in downtown San Diego. We chose this hotel because it is pet friendly, has a little dog park right outside the front lobby and is very conveniently located within downtown San Diego. Steps from amazing restaurants and shops and very close to the pier and water as well. Check-in was a breeze. We are Hilton Honors members and I have to say we definitely received amazing customer service during this trip. While checking in we were informed that we had been upgraded from the Loft Style Suite that we had originally booked to a similar Loft Suite but with about 300 sq. 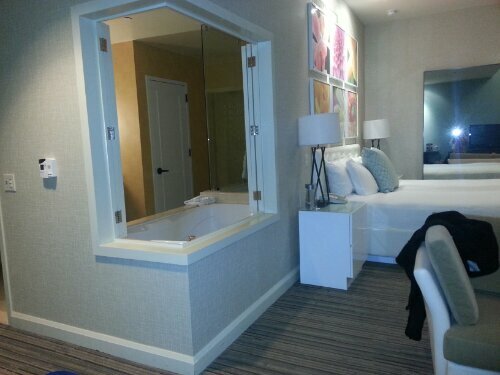 feet of extra room as well as a large jacuzzi tub. Our pet fee (which is normally $75/night) was also comped! Thanks Hilton! Once we arrived to our room Peanut was in heaven, so many new things to sniff! She ran around for a bit while Justin and I got down to the important stuff. Where should we eat for dinner?! Justin called down to the concierge at the hotel and asked where a yummy, dog friendly, place to have dinner would be. He asked if we liked Italian? OF COURSE and suggested we check out Chianti. The concierge even took care of making reservations for us, ensuring that we got a good seat on the patio so Peanut was able to join us. Awesome. We were starving so we packed our stuff up right away and headed out. Peanut was a great sport even with all the distractions of the city! Once we arrived at Chianti we were given, as promised, a perfect little table on the patio where Peanut could join us. I was so hungry that I didn’t even think to snap pics of our dinner but let me tell you, it was delicious! I got the homemade pasta with meat sauce and Justin got the gnocchi. We both, of course, had a glass of wine to go with our meals as well. All in all it was a perfect night for dinner on the patio…the weather wasn’t too cold and the food was delish! After a great first night, we woke up and decided to have a quick breakfast at the hotel before heading out for the day. We dined outside on the patio with a fireplace to take the chill off! The night before we had heard from some people at the dog park that the dog beach on Coronado Island was awesome and that it was a must visit while we were in town. Saturday morning was the perfect time to visit. We packed up and made the short 10 minute drive to the Island and explored the dog beach and let me tell you…I think Peanut thought she died and went to dog heaven. She literally did not stop running for the full hour that we were there. Coronado is a leash free dog beach, so she was able to roam and play at her leisure. After Peanut was all tuckered out we headed back to the hotel. Justin relaxed on the couch with a very sleepy Peanut and I hit the gym for a quick 4 mile run. Gotta get my training runs in! Saturday night we decided to keep it low key, since it was drizzling a bit outside and Justin just ran to the restaurant downstairs and got take-out for dinner. (we had already bought a bottle of wine to drink in the room). Sunday morning our plan was to enjoy a nice breakfast before bringing Peanut back to the dog beach for one last romp before we head to make the long drive back to Phoenix. We had gotten a few recommendations from locals to check out Cafe 21 for breakfast or lunch and that we wouldn’t be disappointed! 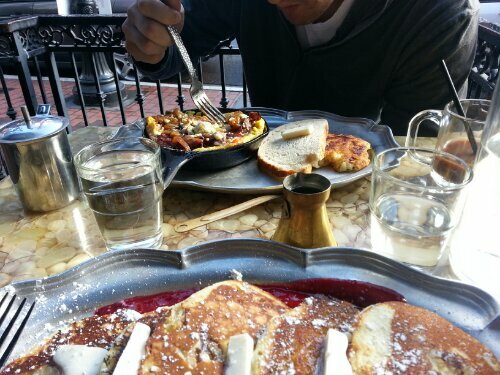 Since locals always know best, we took them up on their suggestion and headed to Cafe 21 for breakfast. Cafe 21’s menu is inspired by fresh, organic produce and they definitely had some different and interesting things on the menu! 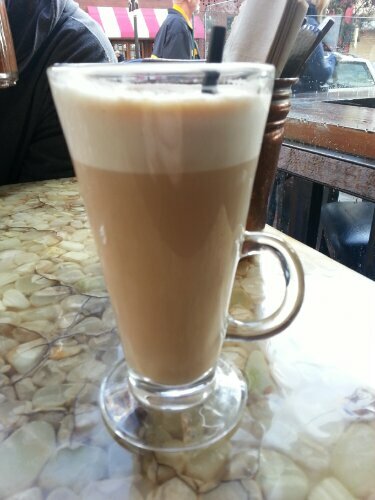 We were again seated on the patio and I ordered a latte to get my morning started. 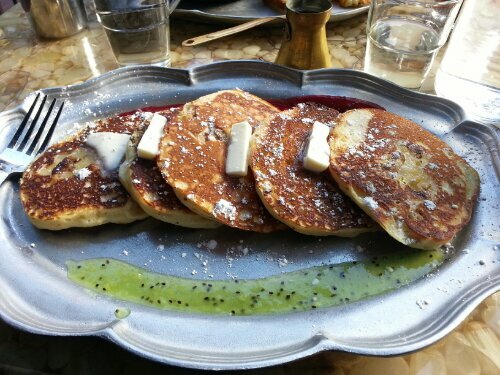 For my actual breakfast I ordered the banana pancakes. Once they arrived, I realized I’d forgotten to order a half stack instead of the full, regardless, they were delish so I’m actually glad I forgot. Not too dense, not too fluffy and also not too sweet. I would definitely order again. Speaking of unusual menu items, Justin got the short rib omelet and was definitely happy with his choice. After breakfast, we packed up the car and instead of heading right for the highway gave Peanut another quick run on her beloved dog beach. She ran and ran for another 30-45 minutes before we called it quits. See you next time San Diego! 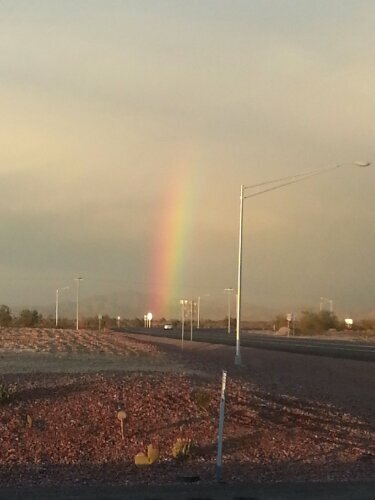 Our drive home was pretty un-eventful except as we were nearing Phoenix, we saw the brightest rainbow ever! Thankfully Justin got a shot while we were at a stop light! And that’s a wrap! Our San Diego weekend in a nutshell. Sorry for the super long post…and Peanut photo-bomb! I’ll be back later this evening with an update on my marathon training and healthy eating to start the New Year! 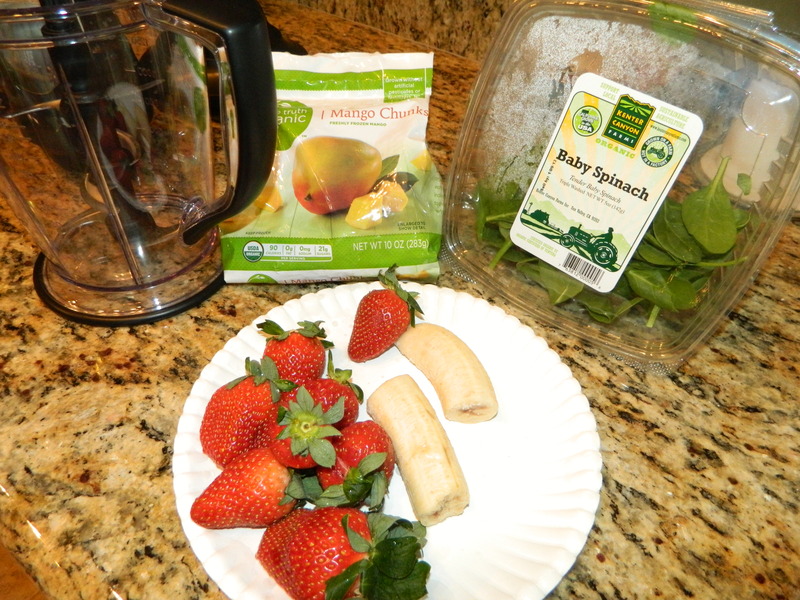 I’m participating in Real Food Runner’s Green Smoothie Challenge and I’m so excited! 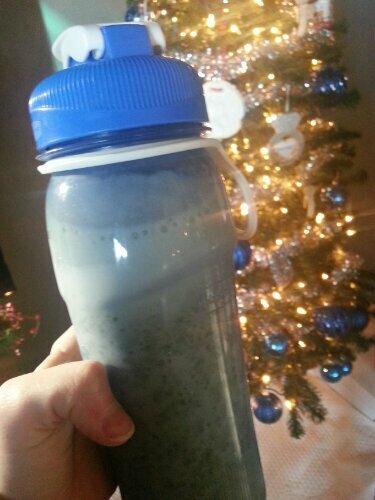 I got a Ninja blender for Christmas so making smoothies is even more fun for me right now! This entry was posted in Doggies, Trips, Weekend Wrapup and tagged Cafe 21 San Diego, Chianti San Diego, Coronado Dog Beach, Hilton Gaslamp Quarter, Phoenix, Rainbow, road trip, San Diego on January 2, 2013 by marielmoves. Hello! My name is Mariel and welcome to Mariel Moves, I'm so glad you are here! I'm 26 years old and I live in Phoenix, AZ with my husband and adorable dog Peanut. Here I'll document my adventures in running, eating and living.